April 24-25, 2010. 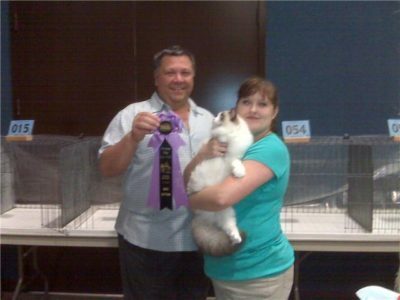 Oklahoma City, OK. Sabrina was Best of Breed Ragdoll Cat in show! 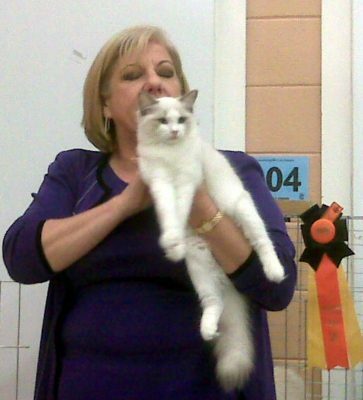 AND Brunowas Best of Breed Ragdoll Kitten in show! RegencyRags had a spectacular end to a sensational beginning of the show season. Sabrina went in with a bang and finished as da bomb! She’s my highest scoring Ragdoll cat to date having now surpassed even Aristede and Daphne. I knew this girl had a something special about her the first time I saw a picture of her at 8 wks old, but it took me a while to figure she’d go this far. Congratulations Sabrina! You’ve been an outstanding companion to me, Schuyler and most recently Bruno as we journeyed through the TICA show season 2009-2010. Bruno also had quite an ending to this show season! I’m so proud of this boy. He’s super big with great boning and a marvelouspersonality. Due to his birth date he’s one of those unfortunate kittens who’ll have a split show career. I truly believe that had Bruno the opportunity to show his full four months during the 2009-2010 show season I’d have another regional win contender on my hands. He’s that good! That’s seven finals for my baby boy! Ok City Show with Hisako Yamada. April 10-11, 2010. San Antonio, TX. What a show! We’re getting down to the wire now with our regional win scores and I’m so committed in encouraging my cats to do as well as they can for our South Central Region. Sabrina says she’s ready to stay home for good and have kittens. Bruno says he loves to show and wants to keep going. I’m exhausted and am looking forward to a nice long break after the upcoming Oklahoma City Show. Me, Bruno and Mary Lou! April 10 -11, 2010. Arcadia, CA. 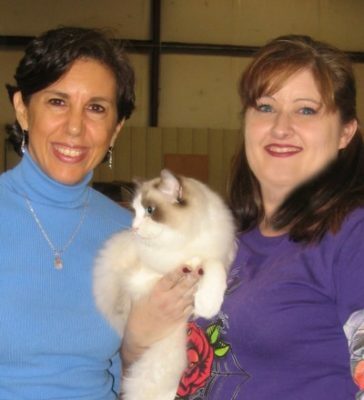 Schuyler, now known as Sky Blue and living in California, attended her second adult show this weekend. 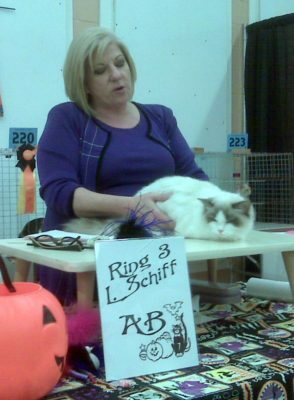 She earned a 2nd Best AB Cat in Laurie Schiff’s ring. She’s now two finals away from her Grand Champion title. Way to go Schuyler! I miss her. March 26, 27 & 28, 2010. Houston, TX. Schuyler is a champion at her very first adult show! I’m so very pleased at how my baby girl has grown up to be such a magnificent young adult. With three more finals she’ll be a grand champion. Maybe next month? Yes, that is her likeness! February 13-14, 2010. Waco, TX. 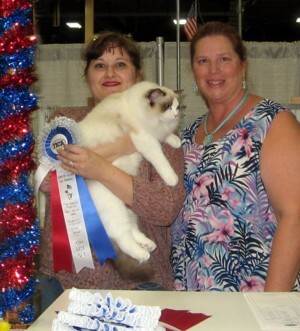 Schuyler was Best of Breed Ragdoll Kitten! So Schuyler ends her kitten career…. I had a strange sense of elation and sadness as I scooped Schuyler out of her very last kitten final in Mary Lou Anderson’s ring on Sunday afternoon. We’d been such a good team, Schuyler and I, and now we were finished. 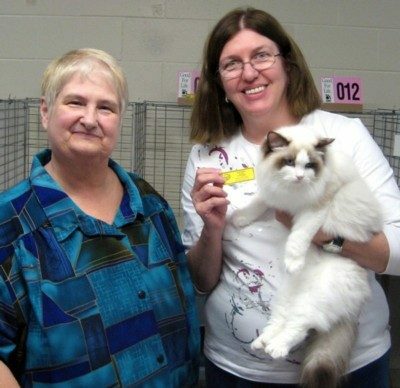 Schuyler made a fantastic finish to her delightful debut in the Ragdoll kitten class! Sabrina also pulled in a few more finals. February 5-7, 2010. Reading, PA. That’s right, Schuyler and I were in the Philadelphia area just in time for a blizzard! It wasn’t nearly as bad as you’d think, and being from areas that never get snow, I actually found it exciting. On Saturday morning the cars were packed with snow. The hotel’s maintenance guy dug out the rental car with a shovel, then I got to sweep all the snow off the car and scrape the ice off the windows! Wished I had taken a picture of me in action with that snow brush. 🙂 Terrific fun, that snow brush. 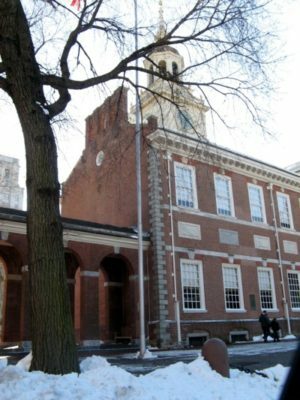 I’d always wanted to see Independence Hall since I was a girl. This is the closest I got. Maybe I’ll actually get inside this historical monument during the 2011 TiCA Annual. January 23-24, 2010. Ft. Walton Beach, FL. 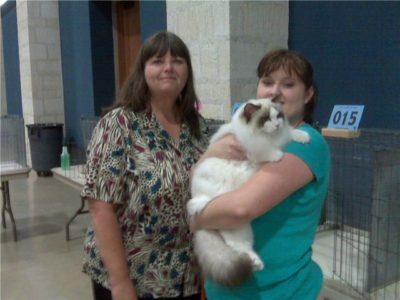 Sabrina was BEST of BREED Ragdoll Cat in show! 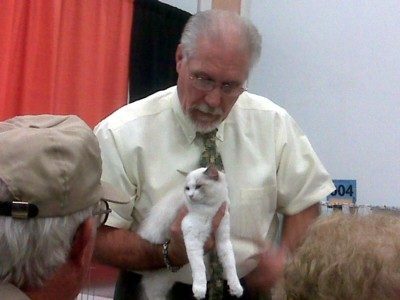 If you haven’t noticed, I love going to cat shows! Even the ones far away are fantastic — like this Ft. Walton show. The girls and I drove all the way from Houston — a hefty nine hour drive — but it was worth every hour just getting to drive across the magnificent South and meet the people along the way. I’ll always be a California girl at heart, but I agree that the South is one of the best places you can live! January 16-17, 2009. Vinton, LA. 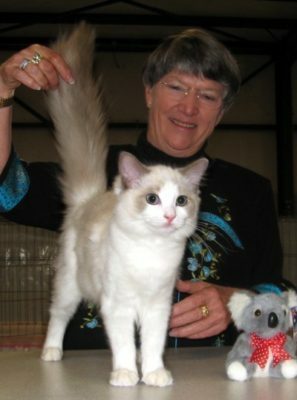 Schuyler was Best of Breed Ragdoll Kitten in show. Besides taking home those coveted awards, the best thing about showing is the group of people you get to see at each show. It’s great to catch up with each other between shows. We even had a visitor from Beaumont, the owners of Drusus who’s the girls’ cousin. Then, as you can see, this was another fabulous show for my girls, Sabrina and Schuyler! I am smiling! December 11-13, 2009. Corpus Christi, TX. 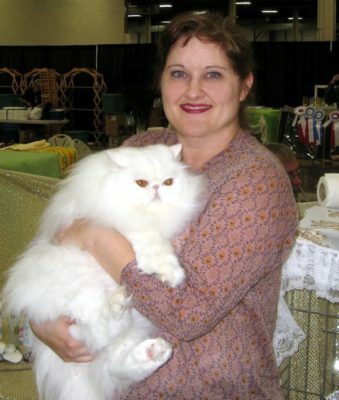 Going into this show I knew Sabrina was set to Supreme, but to get that BEST CAT at the right time is often illusive, especially at a big show like Corpus. My quite voice said she could do it, and she did! Sabrina is a Supreme Grand Champion! 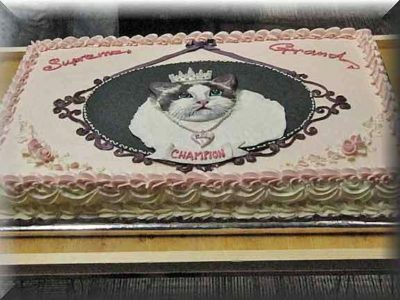 Special thanks to Ana Maria Sosa for honoring my girl with the Best Cat that made this happen. 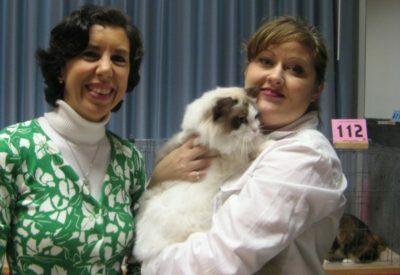 Sabrina’s Best LH Cat with Ana Maria Sosa! Schuyler also had a good time at this show. She’s steadily accumulating points for a kitten award. November 7-8, 2009. Lafayette, LA. All I can say about this show is all around stiff competition! 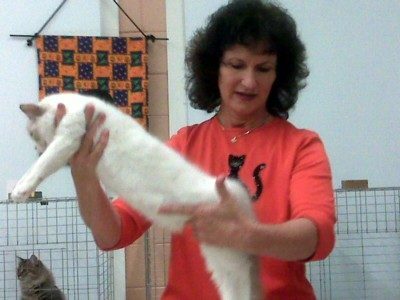 The kitten class of 55 kittens contained the best kittens in the SC as well as many in the SE region. 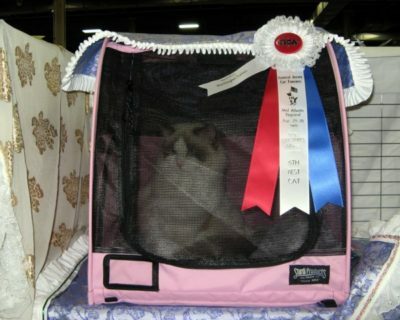 As such, my darling Schuyler, who was Best of Breed Ragdoll kitten in 11 out of 12 rings, only came home with one final. 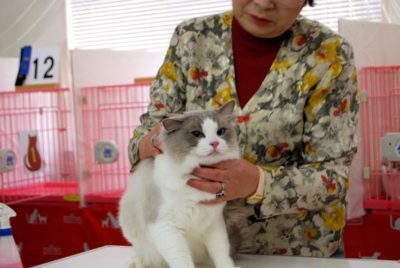 The judges agreed that she’s an outstanding example of the Ragdoll, but much too young to compete against the older kittens in the other breeds presented at this show. 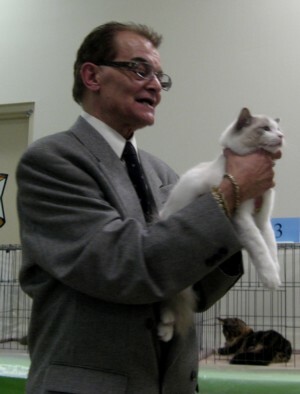 Schuyler took home one final: 10th Best AB Kitten – Don Caruthers. Sabrina fared much better, earning three finals and finishing off her Quadruple Grand Champion title. October 31-November 1, 2009. Waxahachie, TX. It felt so good to be showing again in the SC after a two month absence of shows! The cats and I had a wonderful time. 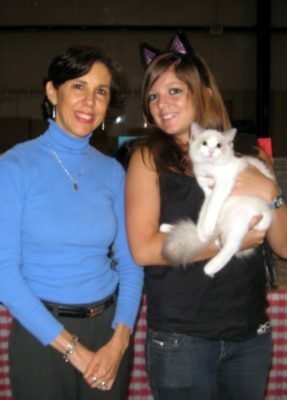 We took home several finals, plus Julia, my darling exchange student from France experienced her first cat show ever. 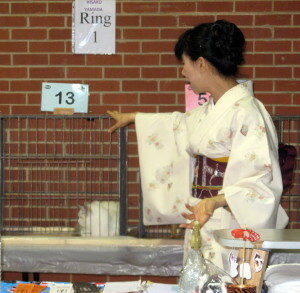 Julia also had the opportunity to steward for two rings during the weekend. 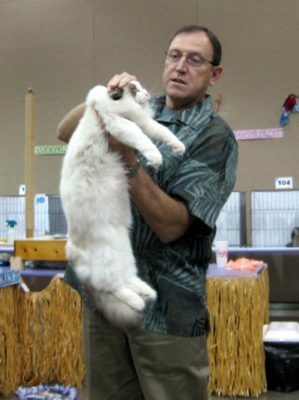 Even with tough competition and a high kitten count of 60, this baby girl – still four months old – managed to earn Best of Breed Ragdoll kitten in five out of 12 rings and get three finals out of 12. Bear with Erin Brown from Austraila. after the LH Kitten final. October 23-25, 2009. Albuquerque, NM. 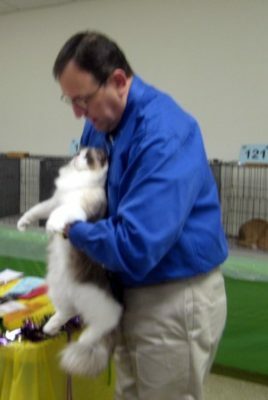 Schuyler was Best of Breed Ragdoll Kitten in show. RegencyRags My Lady Delight (i.e. Schuyler, i.e. Schuye, i.e. Schuye Blue), a tender tribute to her award winning parents, Daphne & Aristede, made a grand near sweep at her very first show this weekend. She delighted the judges with her playful personality and tendency to kiss and snuggle with them all. She received rave reviews amidst great surprise that she had only just turned four months old for this show. In all, Schuyler came home with 12 ribbons out of 18 rings. Update: Schuyler finished 4th Best AB Kitten in Show! — What an amazing start to a grand show career. Not to be forgotten, Sabrina also did her thing taking home four more ribbons which catapultes her to Double Grand Champion status! October 24-25, 2009. Nagoya, Japan. DGC RegencyRags Adonis of Burst took home four more finals this weekend in Nagoya, Japan. I am so proud of this boy and am very grateful to Ryoko for taking him out to shows in great style! Adonis is the full sister to RegencyRags My Lady Delight see above for her show results the same weekend. August 29-30, 2009. Newark, NJ. Sabrina’s done it again! Three more rosettes this time won at the Mid-Atlantic Regional. What a treat to meet some of the east coast breeders and pick up some more points along the way. Sabrina is currently two rosettes short of being a Grand Champion. Here’s her 6th Best AB rosette just the same. 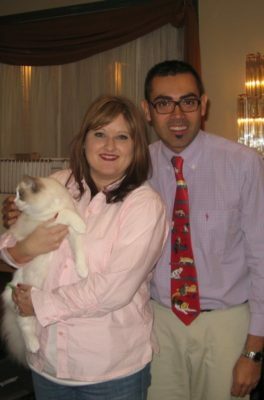 Persian, Snowbelle — TICAs BEST CAT 2004-2005. She’s now retired from breeding and has begun a show career in the Alter Class. was kind enough to let me have my first experience. with Angelique who is herself now retired. August 1-2, 2009. Wichita Falls, TX. Even up against the exquisite older boys brought out by Familytimerags, Sabrina managed to take home two ribbons! This beautific girl is a Champion at the very young age of 8 months and 4 days old. Just four more rosettes and she’ll be a Grand Champion. Posing with Steve after the Finals Presentation. Fate presents all of Sabrina’s great features. 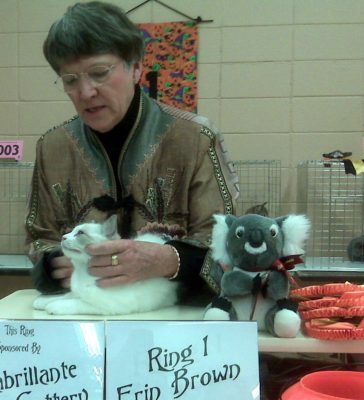 Many thanks to Carol Sue Hale and the cat clubs, MCCT and T-TownKatz, for putting on such an amazing show! 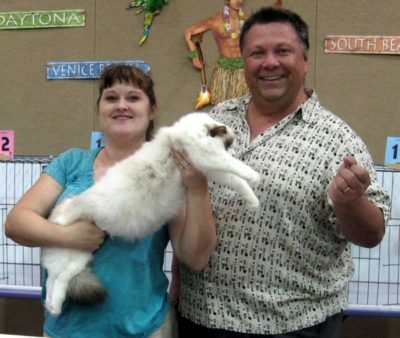 UPDATE: Sabrina walked away with BEST Ragdoll kitten and 5th Best All Breed Kitten in Show! 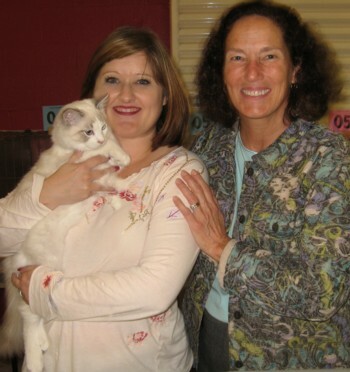 Many thanks to the wonderful Mission City Cat Club members for making this show such a delight to attend! 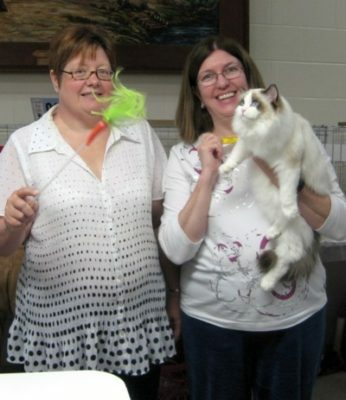 Also, thanks to the fearless judges who dare to handle 150 cats in one day. June 14, 2009. Arcadia, CA. Sabrina made yet another dazzling appearance in Arcadia, taking home three more ribbons! Thank you, Heather, for getting Sabrina sparkling white for the show! May 30-31, 2009. Nagoya, Japan. Ch. 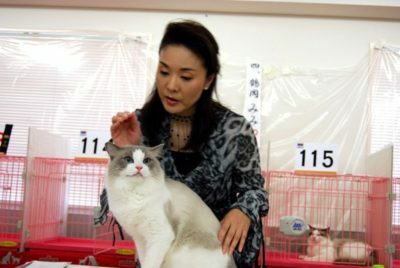 RegencyRags Adonis of Burst took home three finals at the Nagoya cat show in Japan. He’s well on his way to attaining his Grand Championship. Many thanks to Ryoko, who has done wonderful work with Adonis in preparing him for show. What a handsome boy! May 30, 2009. Arcadia, California. 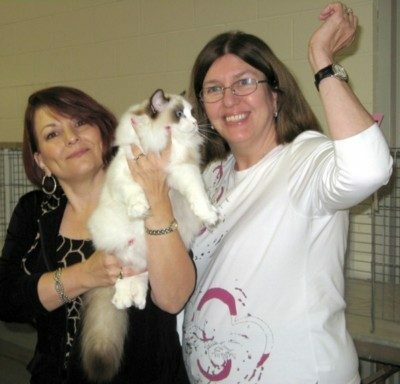 Sabrina was Best of Breed Ragdoll Kitten in show. SnuggleRags Sebring of RegencyRags made a stunning debut at the Arcadia show this weekend. At six months old, she took home three ribbons. Thank you so much, Heather, for being my agent and handling Sabrina so well. You’re the best! !